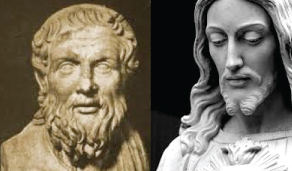 Apollonius of Tyana : The "Apollonius-Jesus" question. In the year 3 or 4 AD (sources differ somewhat on this), the birth of Apollonius took place. This wasn't his birth name btw. from what i've read so far (I'm still learning too). At the same time, apparently another teacher called "Iesus Christus" was born in those same years (3 or 4 AD). He ALSO became a great teacher and healer, performed miracles and was very famous (apparently), just like Apollonius. But you've got to ask yourself: "What's the odds that two teachers of great renown, who did quite similar things, were born and teaching in the Mediterranean world at the same time?" Regarding documentation of the supposed Jesus, my opinion is this: We can't discount anything being forged or added to by those 'Church Fathers' after it was written. They forged a lot. Even the Jesuits had a good go at modern history in the 18th century, by all accounts, before the general population became literate. Their aim was the continuation the Roman Empire. It could not be continued under the threat of the gladius any longer (all of the mercenary soldiers of Rome were a bit 'over it'), but the Empire could be continued by putting the people of the world on bended knee at the feet of a local priest. The whole of Europe had bent to Rome and Constantinople by the thirteenth century - the Byzantine period. We now have to open up to the possibility that "Jesus Christ" might have been an invention of the Roman patrician ruling class. When we open to such an idea, we can see how the life of "Jesus Christ" could well have been modeled after various popular local gods, such as the Persian "Mithra" (1400 BC), Egypt's Horus (c.4000 BC), Greece's Dionysus (c.1300 BC), Rome's Zeus (via India's Dyaus c.3000 BC), India's Krsna (c.2000 BC), and parts of the life of Apollonius, who's name they evidently wanted to completely rub out of people's consciousness. In 325 AD, the so-called "Church Fathers" (Roman elites) met together at the Council of Nycea held in Bithynia - a Roman province in the north-west of modern day Turkey, right on the Black Sea. It was at this council that the Roman Patricians appeared to pull a real swiftie on humanity. From bits i've picked up along the way, i've heard there are Italian families 'behind the curtain' that make Jacob Rothschild look like a pauper. This very important video "Your Soul Is Owned By The Vatican" featuring Australian Santos Bonacci cites some of these names. Are these the descendants of the men who met that day in Nicea, in 325 AD? I want to get to the bottom of it. I think a good many of the answers humanity needs to uncover might lie in reading "The Life of Apollonius". Once we've done that, I think we'll get a fairly good idea if the "Life of Jesus" was modelled after the "Life of Apollonius" ... or whether the "Life of Jesus" was inserted into the Western Consciousness as a DISTRACTION from the teaching of Apollonius, which apparently, had the potential to tear the world of the Roman Empire apart... because it spoke Truth. And after we've figured those things out, then we can get on to pulling apart the components of 'the trick' and show the world what was done. While i'm certainly interested in the religion of Apollonius which is based on the philosophies of Pythagoras (c.582-507 BC), the underlying motivation for me I must say, is much more about politics. Apollonius himself was extremely political and constantly railing against the Roman system, from what I understand. But he also performed miracles and travelled around as an 'itinerant preacher' would today, speaking his message and healing the sick. So Apollonius was primarily a religious man (a philosopher), but one the Roman elites feared so much (and possibly still fear today), that they tried to obliterate all memory of his name entirely. This was affected through the wholesale destruction and elimination of any writing about Apollonius and his life, which necessitated the burning down of the Library at Alexandria (Egypt) as well. That's what some professors think, anyway. So powerful and radical was Apollonius' teaching that he needed to be silenced completely... and the Roman elites achieve this by introducing another voice - The voice of "Jesus Christ". An example of the maintenance of the power structure that only benefits the Roman elite families and which arouses greatest suspicion in me is this: Only the sons of the Roman patrician ruling families could be elected as Cardinals, and from that pool is elected the Pope. I don't know for how long that tradition continued... likely up to the 20th century, at a guess. All of humanity that is affected by the "Jesus" story and who are still living under the curse of Rome. What is today's date? What does the calendar say? - There is the proof that we still live under Rome (the Julian/Gregorian calendar). Such realization would certainly change a lot of the power structures on the planet, if everyone knew the Truth of what those Roman patricians did. They are nothing more than slave-keepers... sheep herders! Please consider Sharing the above post :) The world needs to know about this deception. Mithras relief - the Persian god who sits in the Vatican Museum, Rome Italy. Why ???? - "hidden in plain sight" ?? Note, the horned "beast" and the snake in this carving. Fascinating! I have looked into the many mixtures of deities and stories that surrounds Christianity and Jesus. This I had not come across. Though as you have stated his legacy has been well hidden from us. Thanks for piecing together and posting! Thanks for also being in the hunt to find "Jesus". 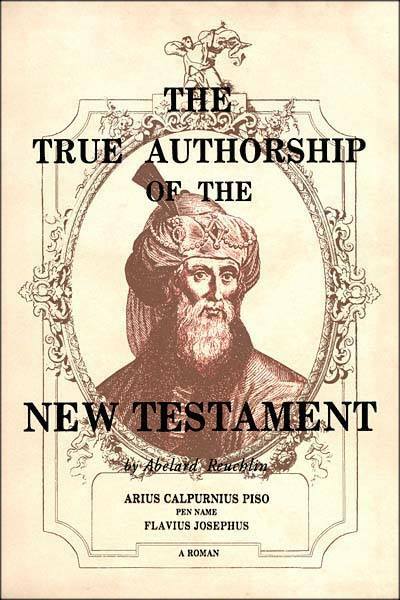 Please continue to comment - especially if you find any parallels between the "Iesus Christus" figure of the Roman Bible and Apollonius as recorded by Philostratus. Thank you. Interesting hypothesis, I must learn more about this. The personification of the Sun has been adopted in many ancient religions. There are ancient Jewish community in India recollection of Jesus walking the sacred rivers Buddha walked 500 years before. They were cow herdsman that came to the middle east. Also argument for Jesus living happily married in his aging in Kashmir. 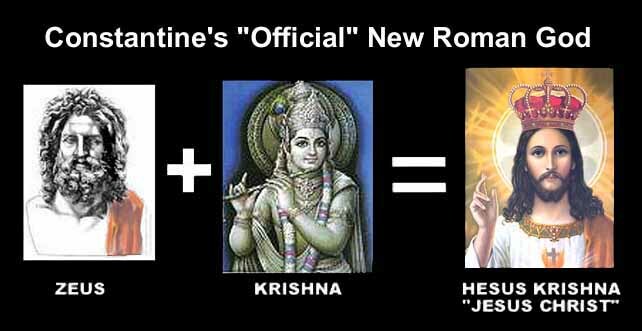 I can see the link Christ in Krst or Krsna although never knew where the name Jesus came from.